My name is Marsha Bergren and I am the designer of the “Twister” tools and books. Other people also call me the “Twister Lady”, usually when they come into my quilt shop, Country Schoolhouse, in Superior, WI. You have to bear with me as this is only the 2nd time (1st time was about 5 yrs ago) I’ve ever even attempted to write a blog! I have to thank Moda’s social media people for taking my words and pictures and making it into a blog. As you can tell I am way behind in the social media world. The Lil’ Twister was made for my customers. I wanted them to have an easier way to make those darling pinwheels that I love. The old way with going through all the steps took way too much time and was very frustrating as your template moved on the fabric and slid on the seams. I made it (after several prototypes) using 1/4” acrylic so you wouldn’t shave the sides off with your cutter. I have a printer who uses an ink that won’t come off easily and the bumpers are made in the USA which keep the tool from slipping and raises it above the seams and it is all made locally. We kept to 1 set of lines so no one would get confused lining up the marks with the seams. I started with the “Lil Twister” and designed it to be used with pre-cut charms and the “Twister” which used layer cakes. This made it really fast and easy to arrange the blocks, put the pinwheel border around and then cut it and put it back together forming all those great pinwheels. The latest member to the family is the “Midi Twister” which uses 6 1/2” squares which is the size of a lot of borders. Just save the border scraps and you can use the “Midi” with those. The books came about as people wanted patterns to use with them. The books go in order of difficulty – Let’s Twist is the introductory book and just has 1 pattern that uses both tools together; Let’s Twist….Again is the 2ndbook and uses both tools in making most of the patterns and introduces “disappearing pinwheels” which allow you to take make a picture of an object using pinwheels and background. The 3rdbook “ Let’s Twist…One More Time” is the book that has a lot more disappearing pinwheels and patterns where the fabrics are not pre-cut but selected by the quilter to go together in the quilt. I am trying to work on another book where I will use all 3 tools together, but have had it in my head for about 6 months and not all on paper yet…..we’ll see when that gets done! I use an Olfa straight handle cutter to cut my pinwheels. I like it as I can cut all around a piece and not have to move. The pictures below show how I do it. You can use either a 45 or 60mm. I found it works best if I stand up and am over what I am cutting so the cutter is always cutting straight down and not at an angle. over the seam lines on the pieced table topper. This is the first cut on the side. 2nd cut along the top. 3rd cut coming down along the side. 4th cut along the bottom. I also typically alternate lights and to get a lot of pop from the pinwheels. I have used fabrics that are just a shade in difference throughout a piece and that gives the look of a color wash and is also quite lovely. It is a lot of fun to just experiment with various types, colors, and patterns of fabrics – let loose and just go for it! 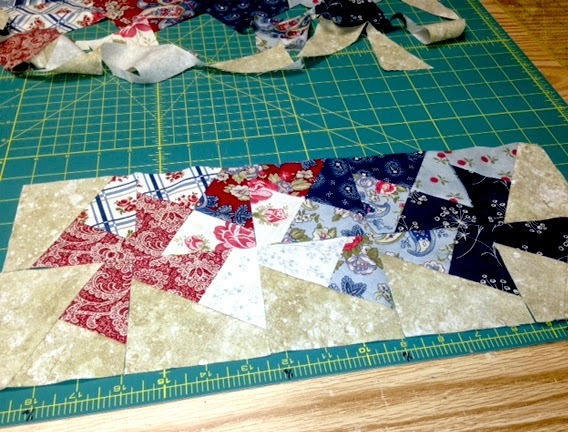 I also pick a fairly quiet pinwheel border that is usually a marble, grunge, or solid and one that is not next to a block that is the same color, etc. This is the row just before you sew it. This is the row with the blocks sewn together. After cutting the 2ndrow, sew the 1st and 2nd row together. The pinwheels are then made obvious. At this point most people understand the concept and then begin to pile and mark the rows and then sit down at the machine and sew all the rows at same time. shows 2 rows sewn together. Disappearing pinwheels are really fun to do. I’ve described how to do them in my 2nd and 3rd books. I use a graph and then take an object that I want to replicate and convert it into x’s on my graph. It is a bit of hit and miss for some of them. I do have a pile of ones that didn’t work! See the example below of the graph and then the picture of what it looks like made up. If you have never tried this technique before, you need to be warned that it is addicting! There are many patterns out there that have been made using my twisters. I only know of a few of those designers myself, but a lot of people send me a picture of what they have done or seen done. I don’t have any idea how many patterns are out there as I have no time to spend on the internet searching for them. I did see a picture of a “Twister” quilt that won the Grand Prize at the MN State Fair. 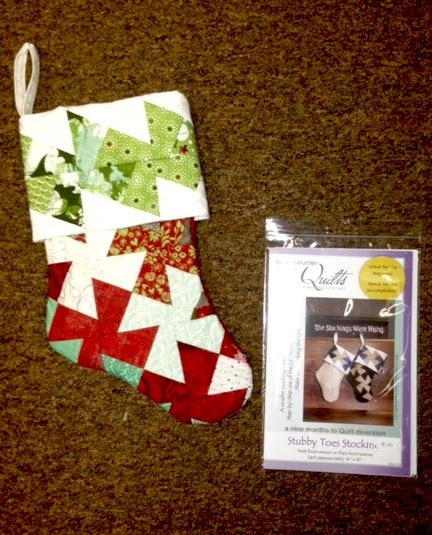 I am working on 2 samples for my shop right now….Quilt Moments “Twister Sparkler” quilt which I am using Bella Solids in reds, greens and black in it and “Stubby Toe Stocking” from Bean Counter using the charm pack called Blitzen. 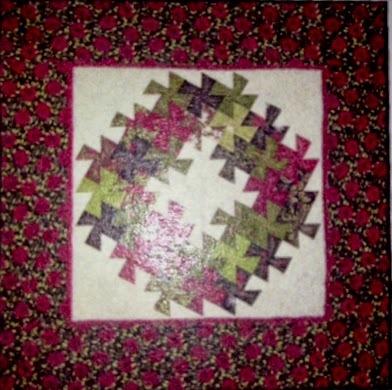 Here is another pretty Twister quilt made by Moda Lissa. You can see her take on the Twister ruler on her blog! Try the “Twisters” and feel free to send me a picture of what you have done and someday when I learn to post them to Facebook I will put them up. You can like me on Facebook here! I will be giving away one of my Twister tools to one lucky winner! To enter please leave a comment about your favorite tools. You will have until September 30th at midnight to comment. All winners will be randomly selected and announced on Moda….The Cutting Table Blog on October 2nd. Make sure to visit the blog every day for the opportunity to win each giveaway!! By Sarah CastanedaIn NotionsTagged Measure Twice Cut Once, national sewing month, Sewing Month, Twister Ruler207 Comments on Time to TWIST! Previous Previous post: Let’s talk about rulers! Next Next post: The Strip Tube Ruler.. My favorite ruler ever! I have not tried your tools yet but am intrigued and would like to. Thanks for a chance at winning one. My favorite tool has to be the rotary cutter. What a time saving invention. Thanks for sharing and keep on “inventing” tools and patterns. My favorite tools are a rotary cutter and mat, I can’t live without them, but where would we be without all the wonderful, fun rulers that are out there. I’d love to try yours. Sarah my favorite tool right now is the circle maker attachment to put on my machine. It makes circles perfectly! Thanks for the chance. I love my 6.5 inch ruler – perfect for trimming up those little hst’s!! Lov ethis twister – makes fun quilt designs! What amazing tools. Thanks for the chance. I can’t live without my rotary cutter. I would love to win one of your twisters, because I have admired those designs for a long time now and I want to make one on my own. Looks like a fun pattern. Thanks for the opportunity to win! I use my 6/5 X 24 inch ruler and rotary cutter on almost every project so I think they should “favorite” status. I love the twister quilts I’ve seen but have never made one. Would love to try this tool out! My fav tools are my rotating mat and my ergonomic seam ripper (a must). I love my rotory cutter and my rulers. My seam ripper is also my friend. LOL Thanks for having this great giveaway and the fun tutorial! I have a small twister ruler but have yet to use it. My favorite one is the 6 x 24 Omnigrid. Recently bought a pineapple ruler and that one is lots of fun too. My fav tools are the rulers. Different sizes and shapes, the possibilities are endless! I made one twister quilt, but would love the other sizes and the books, too!! My favorite tools are my rotary cutter and mat. Who could live without them? I have your “Lil Twister” and the Primitive Gatherings twister that is 2.25 inches. So much fun! Would love to add the 10 inch to my collection. Thanks for the give away! I have the largest twister and all of the books. I have not made one yet but it’s on the list of todos. My favorite tool is rulers. I love them. I do have the lil twister and I love it. I made a table topper and I really liked the way it came out. Thanks for a great giveaway opportunity! I am a real sucker for a new ruler. My favorite tool is definitely my rotary cutter with my spinning mat second. No more picking up and readjusting blocks to trim them. I’ve always wanted to try the twister block. Your tool would be very helpful. I’d love to win! They look so fun. I admit I haven’t tried them yet. My favorite tool is the rotary cutter. Thanks for the twister giveaway! It looks like fun! Love that Twister tool!!! My favorite tools are the rotary cutter and mat. I can’t imagine quilting without them!!! Thank you for the chance! I love my rulers….I would love to have a twister tool to experiment with! One of my favorite tools is the Quilters Rule by Westalee. It’s an adjustable ruler that makes it easy to cut strips by myself. The adjustable strip abuts to the fabric edge for accurate cuts. I purchased one and showed my quilt group and now many of them have one too. It would be great to use this to cut the squares needed for the Twister tools. Thank you for the opportunity!! I love my rulers and cutters! And as I read all the posts on Moda’s blog, I am learning there is a ruler for just about anything to make cutting easier! I can’t wait to give the Twister quilts a try! How fun!! Thanks for the chance to win! The wreath! I have to make one! My favorite, most used tool has to be the rotary cutter. And the mini rotary cutter. Amazing time savers. Rotary cutter and mat, definitely most used tools. The twister tool looks addictive. i think that is what would happen to me! I would love to try it. My current favorite tool would be my Seam Fix seam ripper. I have found it extremely useful when I have to rip stitches when I’m quilting. I’m hoping my next favorite tool will be a twister ruler…*crossing fingers*. Rulers have to be my favorite tool. This blog hop has been so inspiring! I love twisters! I have the lil twister but need to try my hand at the other sizes. Thank you for sharing & participating in this fabulous blog hop. I wondered how people did those pinwheels, they looked so complicated. It is awesome that there is a tool that makes it sew easy! I am a very fickle quilter and my favorite tool changes with almost every quilt. Right now my favorite is the card stock hexie. I would love to win one of your wonderful tools! Thank you. Would love to try this out! I love my rotary cutter! I would be lost without it! Very fun. I bought my Twister template a while ago – and now will definitely be using it! Love the wreath pattern. I’m making my first twister right now, using the mini twister. It’s a blast, and as you say, addicting. Can’t wait to do more! I love my rotary cutter! Your twister quilt is just lovely. I like the fabrics you chose. I love any ruler that has a unique purpose. One great tool to use with the Twister ruler is my rotating cutting mat. Makes it so much easier to cut those blocks. I only have the Lil Twister and would love to try the midi one. Thanks for the opportunity to win! 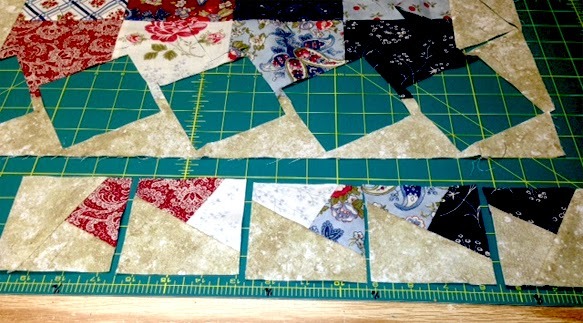 I love love love my 3.5 inch square – since I hate making HST – this has made my quilting life much happier. I have a twister block – and fabric – and it all – but just can’t wrap my head around it – thank you for the post cause this might be the push I need to try this. I love my square rulers – makes those HST some much easier to complete! I have been wanting to try the twister! thankyou! My rotary cutter and mat! I haven´t tried your tool but love all the patterns I,ve saw playing eith them. One of my favorite tools are rotatory cutter and mat,most used.Thanks for the chance! I have not tried your template yet but I really want to. I have seen all the beautiful quilts made with it. I put the books and template on my wish list. Maybe Santa will bring them to me. I love my rotary cutter. I cant do without it. I love any any tool that makes it so I don’t have to think so hard. Sewing should be relaxing, not a headache. I’ve never tried a twister ruler but I’ve seen lots of quilts on blogs using one and I’d like to try one!! My favourite tool is my rotary cutter. I haven’t made a twister quilt yet, but they look like a lot of fun. My favorite tool is my rotary cutter! I would love to make the Halloween Jack twister pattern. It is so cute! 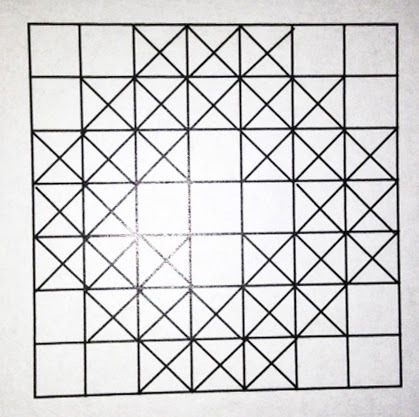 I have tried your Twister ruler once (borrowed from a quilt guild member) and I found it so easy to work with! I’d love to win one. My favorite tool is the rotary cutter. If it wasn’t for that, I would not be quilting or sewing because I’m lousy with scissors! I would love to have one of these rulers! My favorite tools are my rulers, I use them all the time! 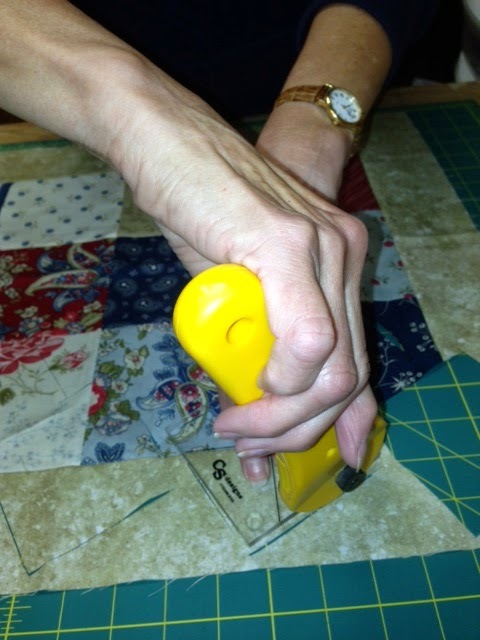 What would any quilter do without their rotary cutter?!!! I CANNOT imagine!! And when you team it up with a ruler like yours a quilter would be in heaven!! Thanks so much for the chance!! My favorite tool is my rotary cutter. My grandmother never even owned one when she made all her quilts and I cant even imagine working without one. I also love to try new tools and templates that come out. I love my rotary cutter. Being one that started quilting before such tools were available, I can truly say I love it. Great tips for the lil’ twister quilts. Thank you. I’ve been wondering how to make a wreath and so many other lil’ twister designs. Always so cute. My favorite tools have to be rotary cutters, self healing mats and long, sharp Clover glass head silk pins. I love all of my Twister rulers! My favorite tool is my rotary cutter saves time so I can do more sewing! Thanks for a chance to win! My favorite tool is my rotary cutter, I do like my different rulers as well and really want to try the twister too. It looks so neat and easy. rotary cutter! my first quilt I cute using a tissue paper template for a log cabin quilt. ugh. still can’t believe I did it. 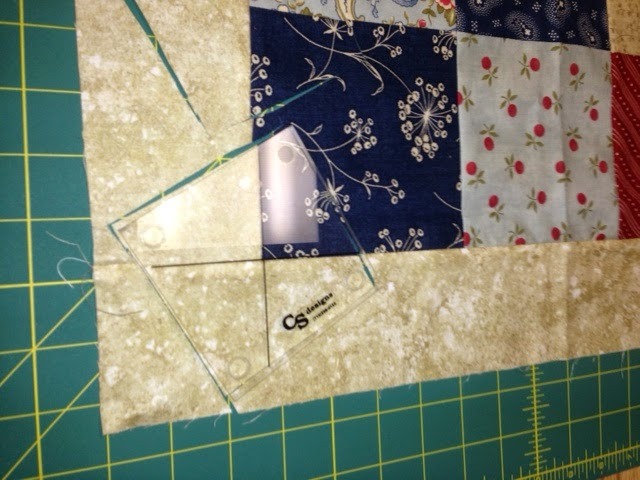 I primarily cut shapes using an 8.5″ x 12″ ruler but also have an Accuquilt GO cutter. I would love to try the twister. The rotary cutter and fun templates like yours are my favoirte tools! Your twister looks like fun to try! My rotary cutter and mat are the two tools I could not do without. I would love to try the twister. This looks like a really fun technique and tool. My favourite tool has to be my rotary cutter. Without it all my rulers would be so much harder to use! The rotary cutter. I just bought your book Let’s twist during our shop hop tour. I can’t wait to use it. .. I love all my tools but my current favorite is my pointy tweezers. Love my rulers and would love the set. Have made a wall hanging and want to try something larger. All time favorite tool? It’s gotta be my rotary cutter! Changed my life! I’m also very partial to my flock of scissors! But rotary cutters rule! I have your first template for charm packs and I’d like to try out that cute chubby stocking. It’s adorable! I’m just starting out, so my favorite tool is the rotary cutter. Thanks for the giveaway and tips! My favorite is my scissors. My husband bought me a very good pair and I love them. I have been seeing a lot of twister quilts and would love to get all the offstage sizes. I have all the twister templates except for the midi. My favorite tool is my rotary cutter. My favorite tool is the rotary cutter. I made a lovely Christmas tree quilt from you pattern. I absolutely love it, and my machine quilter did a terrific job. I have been wanting to try this tool for a while now. Such cute patterns for it, too! I would love to have one of your twister rulers. I am really getting into the “new” rulers and am very pleased with the results. I guess my favorite tool right now is my rotating cutting board. I have seen this and would like to try it. It is amazing how you can sew one thing, cut it up and make something wonderful. My favorite tool is my rotary cutter and seam ripper. Thank you for sharing your creative side with us. I am new to quilting and have seen these twisters. I have wondered how they are made! I would love thus tool! I guess my favorite tool is the rotary cutter. I love my rotary cutter and my 6×24 ruler. I also love my iron and lots of steam. I’ve seen this tool and samples lately and I’m intrigued by it and would love to try it out. I have not used a twister yet , but have been eyeing those lovely pumpkin patterns made with one…just adorable. The rotary cutter has to be the best invention ever! Rulers are always my favorite tool. I have known of the Twister for several years and have this on my bucket list to make. I would love to have the tool. Thanks for a chance to try these rulers. I love the look of the twister quilts I see in Blogland. Besides my rotary cutter I use my Hera marker often. I haven’t made a twister quilt yet. I think it is a fascinating technique. My favorite tool is my rotary cutter. If it wasn’t for that invention I wouldn’t be a quilter. I love my rotary cutter (and omnigrid rulers). Thanks for the giveaway! Favorite tools has to be rotary cutter-Martelli, Olfa mat, then 6×24 ruler and of course a seam ripper. My best tools are my cutting mats. 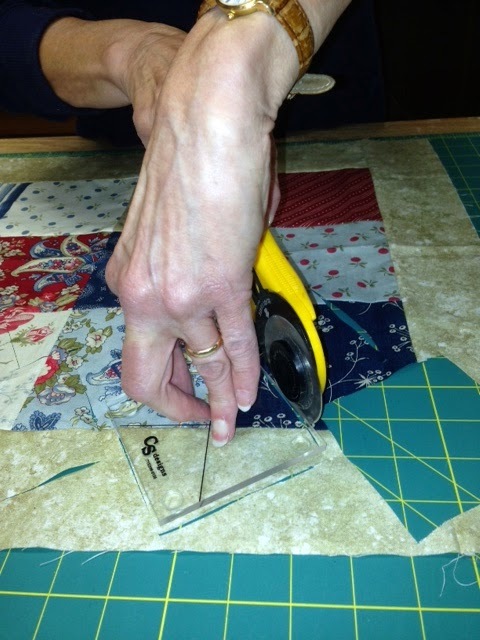 Because I remember cutting everything with just a scissors, my favorite is the rotary cutter and mat – you have to have the mat if you have the cutter!! Rotary cutter and mat. Been looking at these twister quilts for a long time. One of these rulers would be a great tool, too. My Olfa rotary cutter is my favorite tool. Second favorite is my 36×24″ cutting mat. Thanks. My favourite tool is really a set of tools ie rotary cutter, mat and ruler as one really needs them all together. Perhaps I could call them the “rotarycuttermaandruler tool”?? i love me seam roller! My favorite tool is my little red clover clips!! My favorite tools are my rotary cutters and mat. THanks for the chance to win. A twister quilt has been on my wish list for a long, long time! My favorite tool is a 3X12 Nancy Crow ruler which I have had for years and years and years. My favorite tool is the Frixon Pen… erases with heat of iron. Thanks for the giveaway…I’ve been wanting to do a twister quilt. My favorite tool? It’s way to hard to pick just one. All tools are very important when quilting/sewing. I would love to win and try one of your Twister tools. One can never have too many quilting/sewing tools. You make it look so easy and I’d love to make one… one of these days!! My favorite tool is none other than my rotary cutter!! I have yet to work with a Twister Ruler but I just love the whimsical patterns they make. Although I use my Seam Ripper often, 🙁 Rotary Tools have got to be my favorite…how would we quilt without them. I haven’t used the twisters yet but really love the little pinwheel they make. Thanks for having this opportunity to win one. 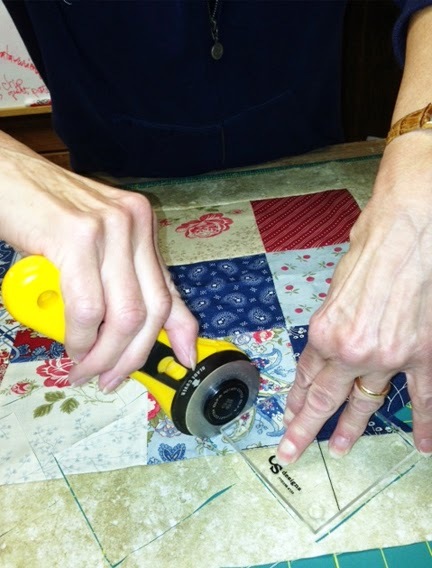 My favorite tool is my AccuQuilt GO! cutter and dies z I love how accurate and fast it is. Your tool looks very intriguing. I saw Missouri Quilts do a demo a few weeks back and it was quite nice. My favorite tool is always the one under the stack of whatever is in my sewing room that I can’t find! That is why I have multiples of nearly all rulers and cutters LOL. Would love to give the twister a try! My favorite tool, like so many others, is my rotary cutter. I can’t imagine cutting all those pieces without it. Love the twister quilts! I’m going to echo a number of other comments, but my most favorite tool is my 60mm rotary cutter by Olfa with the larger handle that closes when you let go of it. I love knowing that I cannot forget to close the rotary cutter and accidentally cut myself or anyone else that may come into my sewing room. After that the tool that I use every single time I am sewing or doing machine embroidery is my brass stiletto I bought from Eleanor Burns’ website. I love that tool for numerous applications. My seam ripper… Of course! Would LOVE to try this. I have to agree with lots of others, my most useful tool would be my rotary cutter! I love your twister patterns, but have yet to make any of them. Thanks for the chance to win a Twister tool! My magnetic pincushion is one of my favorite tools. Love that it holds on to my pins and if they are spilled, it can pick them up much faster than I could. I have always wanted to make a twister quilt, but haven’t decided what size, pattern to make it. Would love to win. Never made a twister quilt, but they look like a lot of fun! I think my favorite ruler right now is my sixty degree ruler. Favourite tools – rotary cutter, mat and ruler. I’ve been admiring Twister quilts for a while, but haven’t yet made one. All the new tools that have evolved in the last 40 years are AMAZING! My first 3 quilts were made by tracing around cardboard templates with a pencil. Rotary cutters are the best! I am a twister and would love to win this one. My favorite tool is the Rotary cutter! Would love to win your midi twister, it would complete my set. Favorite tool is rotary cutter. I am old enough to remember when they first came out. Most used tool this week would be the seam ripper. Rulers rock! I’ve been dying to try a twister. My favorite tool is my 60mm rotary cutter. I’d love to try making a twister quilt – it looks like fun. I love the look created with this ruler! Possibly my favorite ruler! It would have to be the rotary cutter and mat. Without them rulers like this would have a hard time being used. Unless you drew around them and then cut out with scissors! Blah! Who would want to do that now after using the rotary cutter! I love your rulers and these quilts are on my someday list! Love Twister rulers! I’ve made several (it’s addictive!) from charms and yardage and have a ‘fruits and veggies’ one planned for the layercake size. One of my go to ‘patterns’ and hope to do more! Sew much fun! I really like the Twister rulers. My DIL and I each bought a different size ruler and made several. I would like to do the disappearing twisters, they look so intricate and I know, after trying a few that it’s all in the layout before your first cut. It’s a great way to do a quilt. and I use all the excess either in the borders or piece into the back. Thanks. I’ve actually made one little quilt but have the supplies to make a project from the biggest twister. They are fun! The Twister patterns are always so inspirational! My favourite tool is my trim ruler that is 31/2 inches wide. Helpful for cutting those smaller pieces. Thanks for the giveaway. Love this ruler! I saw a YT video and was hoping to pick one up to give it a try! My favorite tool is my rotary cutter, couldn’t imagine cutting every thing with scissors. I have your twister pattern and love it. 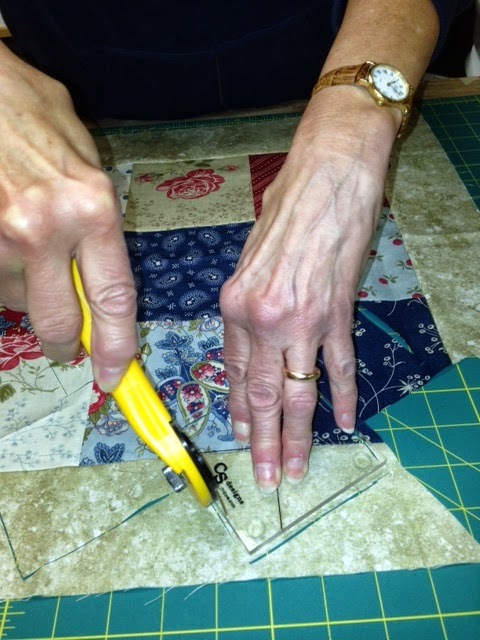 I love my rotary cutter, as a new quilter i cannot imagine having to use scissors!Thanks for the Tutorial. I made a small wall hanging with your twister tool and I have to say…you’re right, it is very addictive! The effect of the pinwheels came out so beautifully and easily. Definitely one of my favourite tools! Thanks for the chance to win some goodies! Love your twister tools and I have 2. The little twister and the smaller one that came with a pattern. Awesome to work with and such fun results. Great quilt shop too!! My favorite tool ( besides my rotary cutter and ruler) is my iPad because I learn so much from blogs and tutorials ! I have admired quilts made from your tool but have yet to try one myself. Other than my rotary cutter I have to say my laptop is my favorite tool as almost everything I have learned about quilting has been online. Thanks for the chance to win one of your cool rulers. Like most my favorite tool is my rotary cutter, second would be my iPad. With it I can look up so many helpful how-to videos. Also search so many patterns and blogs. Thanks for the opportunity to win this tool! My rotary cutter, mats and rulers are my most used and favorite tools. Thanks for the chance to win. My rotary cutter is my favorite tool. I really like my rotary cutter and mat. Thank you for the opportunity to win. I have the first book and two of the rulers and haven’t tried them yet. This post makes me want to get started. Would love the midi ruler and one of the new books! I’ve been having the best time with the twister rulers! Love them. I am about to cut out orange and black squares of fabric to do the pumpkin for Fall!! Thanks for the chance to win! My favorite tool is the rotary cutter. My rotary cutter…and my seam ripper!! My favorite tool is my seam ripper. I always seem to need that thing!! I started quilting when tracing around a cardboard template was used followed by cutting the shape out with scissors. So my favorite tool is the rotary cutter……what a great invention. And of course my sewing machine…..I remember piecing by hand…..it took forever!!! I’ve not tried your rulers but admire the quits made with them and it is on my “to do” list. these rulers look fun, got to give them a try for sure. its hard to pick a favorite, just like kids you love them all but at this moment in time i find i us my 4.5 ruler for a lot of things. As everyone else mentioned, my rotary cutter is my favorite tool. I also like my rotating cutting mat. That function comes in very handy. Love your Twister tool. I have made a few pieces with it. My rotary cutter is definitely my favorite tool! I would love to try the Twister tool. Thanks for the chance to win! I love my shapecutter ruler. My favorite tools are my seam ripper and rotary cutter. I would love to make a twister quilt. my rotary cutter & seam ripper. Thanks for the chance to win!!!!!! My favorite tool would be my rotary cutter. I began quilting long before it came into being and can’t believe how much easier it made cutting. My favorite tool are my scissors on a retractable cord that I clip to my shirt. I never have to search for a pair of scissors while sewing! My favorite tool would be the quilters slidelock. I absolutely love it. My rotary cutter is my favorite tool. I love that it works with so many other things. I think your twister tool is pretty cool. I haven’t used it yet but plan to. Great idea. My fave tool is any rotary ruler. They make things so much easier. I’ve always wanted to be a “Twister”. ☺ Thanks a bunch for the chance to win in this awesome giveaway! My favorite tool has to be a rotary cutter with a brand new blade. I’ve been drooling over the twister quilts so I would love the chance to play with your ruler! My favorite tools are my rotary cutter and rotating cutting mat. Thanks for the chance to win! Looks fun! I’d love to try your twister tool. My favorite tool is a small pair of scissors my Mom gave me when I first started sewing. Thanks for your giveaway. My favorite tools are my rotary cutter and rulers. The accuracy can’t be beat. Oh, I so want this ruler! I just saw the cutest project using this to make a ladybug quilt! I love my 4 1/2 x 4 1/2 in square ruler. I would love to try yours. Making a twister quilt looks like fun. My favorite tool is my rotary cutter. I would not want to be without it. Hmmm…Maybe my favorite tool is my seam ripper–I sure use it lots! I do love my rotary cutters, mat & rulers–have to cut before sewing! Love those twister quilts! I like so much this tool… A perfect tool for a butifful quilt. My favorite tool changes from one day to the next. I love my rotary cutters. I have seen a quilt done with your twister tool. It was awesome. I would love to win this. Thank you for the chance to win! I’d be lost without my rotary cutter and mats. My favorite tools absolutely would be my rotary cutter, mat and variety of rulers! So excited to try the twisted tool. Looks so fun!! I really like your twister quilts. My favorite tools would be rotary cutter and rulers. y favorite tool for small cutting is my rotating mat. Fun for the twister shape. I haven’t tried a pinwheel quilt yet, this would make it so much easier to make. My fave tool is my rotary cutter – I’m so bad at cutting straight lines without it! My favorite tools are the rotary cutter and the binding tool! 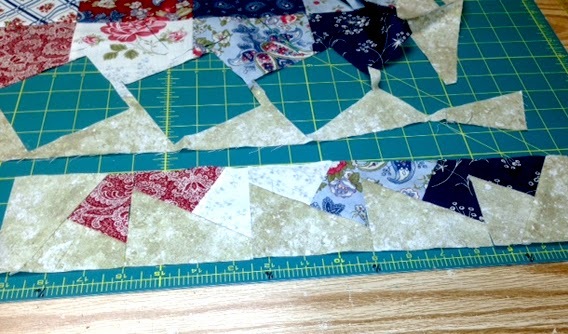 My favorite tool is rotary cutter!, would love to try a pinwheel quilt! Along with pretty much everyone else, I love my rotary cutter! I received The Purple Thing as a gift a few years ago & it’s now my favorite thing! I have always wanted to try the Twister. My favorite tool is the Rotary cutter. In my opinion it revolutionized quilting. I would like to try a wreath with the twister tool. My favorite tool is my Rotary cutter. I have a Twister Shamrock quilt in process…FOREVER. I keep going back to it and will finish by March, I PROMISE!!! My favorite tool is my round tip embroidery scissors. Use them for everything. Love the twist tool. So much fun to make. Thanks for the chance to win. I have your first two twister rulers and first book. I saw them a long time ago on Moda Lisa, searched you out and ordered for my friend and me. We love them. My favorite tool is my stiletto. Would luv to make the twisted pumpkin I saw in Keepsake Quilting. I have made one table topper using the Twister, and it was great fun. But, i have to say that my favorite tool is the Rotary Cutter. It has made cutting so much easier! Hard to pick a favorite, so i looked on my sewing table to see what was out there. Sorry to say, it is my seam ripper. The twister tool looks like fun! I love rulers. Having the right one makes the process faster and moe accurate. This looks like a really fun ruler that would definitely make twisters much easier. My favorite tool is my rotary cutter. I can’t imagine making a quilt without it. My favorite tool has to be my rotary cutter. But I love rulers and templates too! My favorite tool has to be my olfa 60mm quick-change rotary cutter, followed by my Gingher thread snips. They live right by my sewing machine at all times. I haven’t tried your Twister tool but would love to do so. Thank you for the giveaway! There are so many amazing tools out there to use with my favorite the rotary cutter. Just think where we would be without it. That does look easy like that. My fave tools are cutter and ruler, thanks for the giveaway. I have been intrigued with all the “Twister talk”, but have not tried one yet. That could all change, thanks for the giveaway. I love my little specialty ruler/templates – they make me feel sooooo – special! Your ruler is so easy to use. I made 4 table runners last year for Christmas gifts. It didn’t take any time at all. I love the Twister template! Thanks for a great giveaway! oh my favorite quilting tools would be my rulers and rotary cutter! they are essential! the “twisters” looks really neat! I would love to make a quilt using it! I’ve really been wanting to try a Twister quilt, so I would be thrilled to win. Hard to say what my favorite tool is, but I guess it would be my rotary cutting rulers that have raised ridges on the back. I’ve seen so many twister quilts but have never made one b/c I don’t have the ruler! My favorite tools right now have to be my rotary cutter and my Clover needle threader for threading hand sewing needles. These eyes of mine are showing their age! Thanks for the chance to win the Twister. Being a new quilter I haven’t purchased too many tools yet but I’d have to say at this point that my favorite would be the rotary cutter and mat. The twisters have intrigued me and I would like to try one soon. Thanks for the tutorial and the chance to win! I am working on a Twister quilt using Holiday fabrics right now. Love the tool! Hope to try these on quilts for my granddaughters. We sell the Twister Ruler at the shop where I work and what I like about the large one (used with layer cakes) is how you’re left with those very use-able pieces of fabric…. there really is very little ‘waste” and I appreciate that!!!! I bought this tool and love it! I taught it at our retreat and some of the others made my pattern too. Thanks! This concept is so appealing to me, a math teacher. I would love to own one or more of your rulers and patterns. My favorite tool is of course the rotary cutter and on omnigrid ruler, as many sizes and shapes as I can afford. I have seen this tool and would love to have one. My current favorite tool is the Wonder Clip; great for holding the binding while hand stitching.